Even though my views on woodturning may divide opinion and offend sensibilities, I have always favoured enhanced and coloured pieces as opposed to those which are 'pure' in their appearance. Having worked on this magazine for over five years, I have seen a lot of different pieces and have always been drawn to those which, in my mind, stand out and beg you to engage with and touch them. My point is that the work of Michael Bauermeister is one such case in point. I came across his amazing sculptural pieces in a recent issue of American Woodturner and previously when I profiled him for our online feature 'Maker of the Week'. 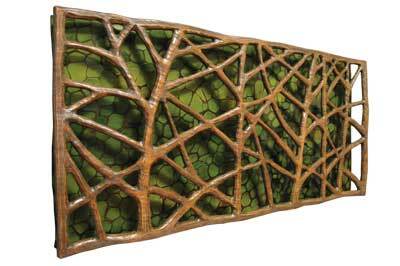 I recall instantly feeling an affinity with the shape, colours and textures which each of his pieces displayed. 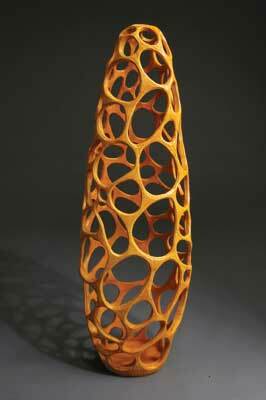 I wanted to find out more about Michael and also the story behind this sculptural woodturner. Michael is obviously a busy man, but it was a pleasure to put this article together with his help and delve into the mind of the man who claims that wood has become his voice and language. Michael tells me that he lives in a rural area outside of Augusta, Missouri, in the Missouri River bottoms, 45 minutes west of St. Louis. His workshop fills the first floor of the 1920s-era Meinershagen general store which is about all that's left of Nona, Missouri. It is surrounded by thousands of acres of corn and soybean fields. The workshop has high ceilings and big windows. Michael explains that it came with the old store shelves and counters so he has lots of storage and can usually find what he's looking for. "I've been working in this shop for 25 years now and it feels like an extension of my body, like one big tool that I work from the inside." Upstairs, where Michael used to live with his two sons, is now his gallery, office and photo studio. Michael comments that he enjoys the solitude and tranquillity which the rural Missouri countryside offers him. Michael was born in Indianapolis, Indiana, grew up in the mid-western United States and has lived most of his life in Missouri. He explains that he was raised in a loving family with parents who were very supportive of whatever he wanted to do: "I was interested in art from an early age but didn't get serious about wood until my late teens." He tells me that his art talent was evident as early as sixth grade in art class and he comments that he "loved making clay figures - I can remember thinking even then that sculpting is what I was supposed to do." While a student at the Kansas City Art Institute he worked in a lot of different media, finally settling on wood before he received his bachelor's degree in 1979. The Art Institute had a lathe and Michael received basic instruction in how to turn wood there as well as instruction in how to use a deep fluted bowl gouge from a visiting bowl turner. After graduation he bought an old Shop Smith and set up a little studio making furniture and doing custom turning since he "couldn't yet figure out how to sell sculpture. I supported my family for 15 years with furniture commissions," he explains. However, it wasn't long before he was drawn back to sculpture and eventually started creating small wooden bowls and was able to fuse these two mediums. When asked about the type of work he produces, Michael says this: "Though it might sound heretical to some lathe-lovers the lathe is just another tool to me. I would describe my style as extremely practical." He tells me how he uses the deep fluted gouge 90% of the time and a few scrapers for the rest. He cuts as cleanly as he can and then sands if he is going for a polished surface: "I'm more interested in textured surfaces that show the marks of their creation than in a lot of polished wood. The surfaces of my work are usually marked by carving and turning and frequently painted.â€ If you look at a selection of his pieces you will notice that most of them are elongated, smooth cylindrical shapes that are narrow at the base and flared out near the top, with small openings suggesting some type of vessel. In fact it was one of his tall sculptures called 'Twist and Turn' which first caught my eye and it was only later that I discovered his more sculptural pieces which, to me, are indicative of nature in their shapes and depictions. Despite using colour throughout, the shades and hues this turner uses are muted and natural, which seems to work incredibly harmoniously. 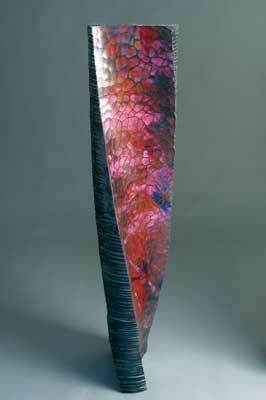 He started adding colour to his pieces using a clear lacquer enriched with colours he mixed himself. But as Michael confirms, he likes his colours to look as if they occurred naturally, gaining inspiration from Simple and practical are the words Michael uses to describe his pieces, and he tells me that he finds simple forms with good proportions and graceful lines to be the best: "My work is contemporary with great respect for past cultures and traditions but little patience for fussy ornamentation. I derive my surfaces from the energy of the work of making the piece," he explains. Michael likes his work to be new and fresh for the viewer, unlike anything they've seen before. It is amazing to think that this turner's work has evolved from the work of that of a production turner, who made hundreds of baluster spindles and green-turned, simple shaped bowls, to the beautiful, organic and contemporary sculptures which are now his livelihood. And the most exciting part is that his shapes are continually evolving as he is faced with new ideas, challenges and commissions. 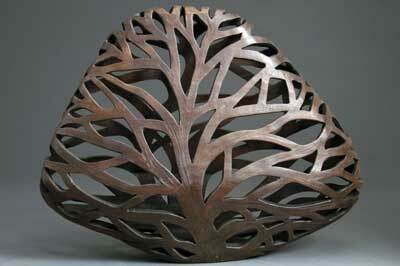 Michael's pieces are made with Missouri woods such as cherry (Prunus spp. ), walnut (Juglans regia), oak (Quercus robur), maple (Acer campestre), Osage orange (Maclura pomifera) and pine (Pinus spa.) and he is mindful of not wasting the natural resource. Although most of his wood comes from timber yards, he also uses salvaged wood that is sourced from an urban log recycler in St. Louis that collects downed trees that normally would end up being ground up, burned or buried. Many of the tall, sculptural pieces Michael makes are over 1.8m in height, so we're not talking about small pieces here. As many turners are aware, working with such large pieces is problematic and requires great skill to create a pleasing form. 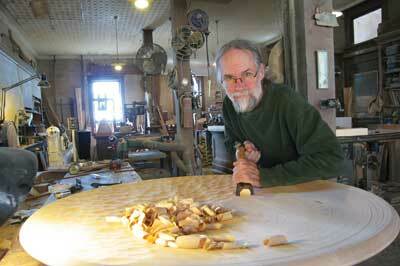 Michael explains that in order to turn these large forms successfully, he had to develop his own method. The technique involves slicing separate layers of wood from a single block and then stacking and gluing them back together into a contemporary shape. Michael explains that making the shapes and sizes of vessel he is best known for would not be possible to make from a single block of wood, hence the reason he has to think outside of the box. To further shape the object, Michael uses some of his own techniques such as turning the piece with the lathe set at a very slow speed, which affords him more control over the incredibly large piece. He then uses power tools to add surface decoration and texture to the piece, also calling upon custom-made tools to help create different surface textures, such as the scalloping detail which is common throughout much of his work. As many of the vessels Michael makes are so large, he has a small hydraulic cart that he uses for everything from lifting heavy objects to clamping. In his words, "I'd be lost without it." In terms of other important tools and equipment, there is also the linen buffing wheel for honing all his edge tools, which according to Michael, "saves a lot of time at the sharpening stone." He tells me that the big pieces he creates are in the studio for at least a month. He tends to work on one big piece and a few smaller pieces at once so he can move around and keep his vision fresh. Unsurprisingly, Michael comments that the inspiration for his pieces primarily comes from the natural world and from the 'made' world. Inevitably working and living in such a tranquil and idyllic setting impacts on his work and Michael explains that he likes his work "to reside somewhere in the middle." He goes on to further say that he likes to think that, "If you stumbled upon one of his vessels in the woods, you might not know if someone left it there or if it grew there." "I spend a lot of time in nature, walking, biking, paddling or just being. The colours and textures of leaves, rocks and water inspire me. And I'm trying to figure out what we are doing to our environment and how I can comment on that in my work," he tells me. I was intrigued to discover that this turner also looks to cities as an equally important source of inspiration for his work; he loves to see the work of craftspeople from the past who made utilitarian objects with no thought of art but with such care and attention to detail that looking at them now he can't help but see an artistic spirit there. "The patinas of age and use can add a narrative of their own," he says. "Sometimes I feel like I'm trying to reverse engineer all this in my work." The American folk art collection at the Smithsonian Museum in Washington includes two of Michael's wood sculptures, and he tells me that this was certainly a high point of his turning career. Additionally, in Moscow and Abu Dhabi, his art is displayed in the lobby of the American embassies and gallery owners from Seattle to Los Angeles and New York to Miami sell his work. As well as these notable achievements, Michael also comments that he still gets a high any time he can get his sons involved in his world of wood. "I enjoy that immensely," he tells me. In terms of the lows, Michael explains that his work is by choice solitary and even though he usually likes it that way, sometimes being alone in the studio when things aren't going so well can be difficult, and understandably, can put a strain on creativity. However, his love of creating shavings and the pleasure he derives from roughing out a nice shape with a sharp tool and a beautiful piece of wood don't allow him to wallow for long. So, what is a typical daily routine like for Michael? He comments that in terms of work ethos, he doesn't work as hard as he used to but he still puts in a lot of hours in the workshop: "In this work that we do there is no substitute for putting in the hours; it just takes time. Most days I just work until my back tells me to stop." Michael explains that he wakes up without an alarm clock at whatever time seems appropriate. It might be dawn if he has a project due or something new that he is really excited about. Or it might be a bit later! "I then have coffee, check my email and walk to the studio." The first task is tidying up the workshop and getting everything ready to work on as well as refreshing his memory as to what he's working on. He comments that mornings are his most productive time and this involves decision making and creativity. He tries to start with some good physical work and then something more contemplative before lunch. On a good day Michael's wife, Gloria, meets him for lunch at home then it's back to the workshop to try to reach some objective for the day. "At some point in the afternoon I like to take a break and go for a bike ride though this might be moved to the morning if the day threatens to be really hot!" Then it's back to a couple more hours of carving or turning before he heads home for, "dinner, a beer or two, and maybe some guitar picking with my wife and friends." When charting the evolution of Michael's work from that of production turning to the creation of one-of-a-kind, 'human scale' wood sculptures, one can't help but wonder "what's next?" Michael informs me that his plan is to focus more on the wall pieces he makes and develop some new sculptural forms: "I'd like to figure out a way to incorporate a narrative in some of my work that comments on the damage we're doing to the environment." So, this turner is not short of ideas, which is very exciting news to hear. It is also inspiring to hear that this turner is living his dream and his creativity and unique ideas seem to know no bounds. So, we wait with baited breath as to what Michael develops next, and we can promise that whatever it is, it will be sure to grace the pages of Woodturning magazine!